You are a highly influential person, although you may not yet know it. Perhaps you are not yet aware of the influence you already have. Maybe you have not yet seen the reality of the influence you will one day have. Your influence lies dormant, waiting to find its full potential, which is not merely twice as much potential as you believe you might have, but 100x, 1000x, or more. 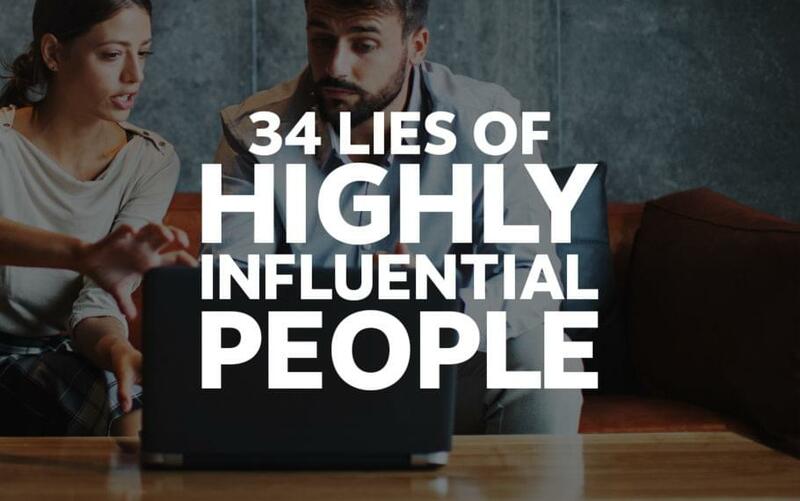 Perhaps it’s one of these 34 lies that highly influential people often tell themselves. No time. So you’re a home schooling single parent with 10 kids, a farm, and a business? You still have time. If Penelope Trunk (warning: language) has time, you have time. No money. Do you have a computer or a phone? Do you have internet? Then you’ve got enough money. I’m too old. John Houseman started acting when he was 71 years old…then he won an Oscar. You’re too old? Really? I’m too young. You mean 8-years old, like Evan was when he was making $1.3M per year making Lego videos? Or 17, like Connor Blakely who was consulting Fortune 500 companies and getting written up in Forbes at that age? I’m an introvert. Go read Quiet by Susan Cain. It won’t make you loud, but as a fellow introvert I promise it will make you feel better. Regardless, a bunch of influencers out there are also introverts. I’m not saying it’s not harder to put yourself out there if you’re an introvert–of course it is, but that doesn’t mean you can’t do it. I can’t write well. Neither can I. Seriously. But maybe your idea of what “writing well” is, is different than what your audience thinks it is. Plus writing well is a skill, one you can learn. I learned to write better by reading a lot. If you want to learn how to write well, go read On Writing by Stephen King. Yes, that Stephen King, and if you don’t like that Stephen King’s books (I don’t), give this one a chance. I need a website. No you don’t. Trust me, I even run a marketing firm that creates personal brand websites, and even I’m telling you that you don’t need a website to get started. I’m overwhelmed. It might because you have your head full of all sorts of things you think you need, or things you think you need to do, in order to become influential. How do you eat an elephant? One bite at a time. Start with one thing. I can’t speak well. Then write. Or fill your mouth with rocks and practice speaking. Or listen to Grant Baldwin’s podcast or read Michael Port’s book Steal the Show. I don’t like people. I’m going to assume you’re not pathological, suffering from clinical depression, or on the verge of some sort of breakdown. If you’re any of those things, talk to a psychologist. If you just get tired of people sometimes and feel grouchy a lot, then perhaps you’re right about whatever it is you think about other people. Maybe you’ve been unlucky enough to be around a bunch of jerks or losers most of your life. Maybe you feel superior to most people, and you don’t like yourself, so you’ve concluded the rest of the world must be even worse. I’ve only got one solution for you–forget yourself and get to work. Lose yourself in service to others, perhaps the worst type of people you can think of. Start serving, without thinking about yourself at all, and I suspect you’ll start feeling better about those people, and yourself. Tell me how it works out for you. I need a lucky break. Lucky breaks are nice. I was lucky enough to have a mother who gave me a love of reading. I was lucky enough to get a great education. I was lucky enough to enjoy blogging. I was lucky enough to have a friend who introduced me to an editor at Forbes who liked what I was blogging about. I had been blogging for 10 years and had written almost a thousand posts at that point. What’s that they say about luck, how it tends to happen when preparation meets opportunity? There’s something to that. I’m paralyzed by fear. Keisha Blair has a piece on Medium that will give you 16 Steps to Overcome Your Fears. What helps me is to remind myself that my audience wants me to succeed. They’re my cheerleaders. I realized this when I attended a TEDx event and saw a speaker choke. I mean seriously choke, for five full minutes! It was soooo painful to watch, but then the audience started calling out, saying things like “Take your time!” and “We love you!” I still get nervous when I get up to speak, but now I know the audience is on my side and it helps me keep the butterflies under control. I’m not smart enough. Many of the most influential people in history were individuals whose confidence outstripped their intelligence by several factors. If you don’t feel smart, keep things simple. That’s what people like, anyway. I try to write at a 5th grade level. That’s not because I think you have the intelligence of a 5th grader, but because that’s what most people find comfortable to read. Ever read something that had lots of flowery words that make it sound like the writer is showing off? Ugh, annoying. There are too many “smart” people in this world. Fake it ‘til you make it. You know the guy who rents a Lamborghini and takes photos of himself in front of a mansion and says “I can teach you how to make millions!” Don’t be that guy. If you can fake it well enough to fool anyone you’re probably working harder than if you did it for real, so just be real. For the record, the last car I bought was a used minivan. It’s not my personality. What isn’t? Helping other people? What is it about being influential that’s not within your personality? Chances are you have a preconception about what it means to be influential that isn’t based in fact. If “it” isn’t part of your personality, then influence in ways that are. I’m going to look stupid. Um…ok, I’m going to give it to you straight–you’re right. But you’re only going to look stupid to yourself. Nobody else will care. It’s like going to the gym for the first time. You think everyone is watching you and laughing at you, and after a few weeks you realize nobody cares. I need an audience first. Having an audience is a great thing…but audiences don’t come from vending machines, they’re built over time through countless interactions that create trust. What you need first is an objective, then to know who you are, then to know who your audience is, then the right message for them, and a channel to deliver that message. Then you can start delivering the message and building the audience that will buy your book and pay you to speak. There’s an order to this and if you try to shortcut the process by thinking you can buy a following on Instagram chances are you’ll spend more time, money, and effort that way than if you just focused on creating great content and delivering it. I need more experience. Don’t we all…well, no, we don’t. We want more experience, and we can benefit from more experience, but we don’t need it to get started. Here’s an easy way to get started even if you have absolutely zero experience in the area you want to focus on–interview those who do have the experience. Now is not the right time. And when will it be? “No,” you say, “Really, it’s really not the right time.” Maybe you’re right, but probably not. 99% chance you’re lying to yourself and it will never be the right time until you make it the right time, so why not make now the right time? Influence is about “tricks.” That’s short-term thinking. Tricks can work, and sometimes they can help deliver the goods, but they’re no substitute for real value. I don’t know who to talk to. You don’t know who your audience is? Then open your mouth, start talking, and see who listens. Make it easy for them to find you. Yes, it’s important to figure out who your audience is, at some point, but that point doesn’t need to be Day 1. I’m still figuring out exactly who my audience is, and perhaps I’ll never stop figuring it out. I need more credibility first. Credibility can help. When I published my 1,000 blog posts nobody cared. When I wrote the same stuff for Forbes suddenly people cared. But I never would have gotten the chance to write for Forbes if I hadn’t blogged first. In the long run, content beats credibility, because credibility comes from the content. I’m not good looking enough. I feel your pain, because I’m looking at you…ha! Just kidding. But seriously, very few people are as good looking as you think they are. Lighting and makeup can work wonders. You know what really makes people good looking? No, not beer–confidence! There are ugly, short, fat guys running around with beautiful women, and unattractive women with gaggles of guys after them, and the reason why is confidence. Work on your confidence and nobody will care much what you look like. That said, take care of yourself, I’m not advocating that you eat Ben & Jerry’s all day and try to become influential while wearing stained, stinky sweatpants. Nobody cares what I have to say. Flat out wrong. There is someone out there who doesn’t care what anyone has to say except you. And not just one person, but hundreds, thousands, perhaps tens of thousands. You just need to find them and deliver your message. There’s something wrong with me. George Clooney said he would never run for office because he’s slept with too many women and done too many drugs. I think that’s a shame because despite Clooney’s past bad behavior, I think he’s a good guy, even if I disagree with him on a lot of political ideas. I’d rather have 10 flawed-yet-honest politicians than 500 corrupt ones with polished exteriors. Perhaps whatever is wrong with you can even be part of your genius zone. It’s beneath my dignity, I’m too pure. It’s not, and you aren’t. You’re a victim of your prejudices and misconceptions of what it means to be a person of influence. You have to be dishonest to be influential. There are certainly people who are master manipulators out there, and seem to know just what to say and how to say it to part fools with their money, but there are bad actors in every profession. Don’t let the bad influencers stop you from sharing your gifts with the world because you made the incorrect assumption that everyone who is influential is lacking in the integrity department. I need to focus on a big group of people. It’s tempting to say “I help everyone do everything!” but nobody will believe you. Start out niche, turn that small audience into raving fans, then expand. I need to focus on a small group of people. No, I swear I’m not contradicting myself. The mistake is to make yourself unavailable to a potentially wider audience. It’s wrong to charge money to help people. My wife has a bunch of great vegan recipes like vegan mac and cheese and vegan lasagna that actually taste really, really good…and I’m something of a mac and cheese aficionado. I keep telling her to do classes locally and charge for them but she feels guilty, but without people paying she’s not committed to it, because she’s not asking anyone to commit to her, and the world is poorer as a result. Now, my wife has plenty of other things that are perhaps more important, but you get the idea. If you charge money for the influence you have, you are more committed, you can afford to do it more, perhaps full-time, and the world is richer for it. There’s nothing wrong with asking people to pay you as long as you deliver what you promise. Nobody is being forced into it. Why not give them the chance to get what you have to give? I need a better camera, mic, computer, etc. Got a phone? Got a computer? You’re good. Lots of influencers start out this way. Many continue this way. Typically this is just an excuse to cover up for something else, like fear. I’m too sensitive, I can’t put myself out there. What are you afraid of? What’s the worst that can happen? Someone you don’t know and will never meet will leave a mean comment on your YouTube video, which you can then delete? Ok, ok, I’m a bit sensitive myself, and when someone calls me out for something it festers for a long time, even if I think I’m right, and that can be discouraging. The reason I keep putting content out there is because I know for every person who says something critical or unkind, there are 100 who feel the opposite way, and it will be the same for you. The only difference between you and me, perhaps, is that I’ve been around long enough to know this is the case. Someone has already said what I have to say. No, they haven’t. Just because they said the same words, talking about the same topic, does not mean what you want to say has already been said. You are unique. Your context is different. You can say the exact same words someone else says, and it will be taken differently. For example, if you’re a woman saying something a man has already said, perhaps there is a woman in your audience who has trouble trusting men, so she can’t listen to the man say it, but she can trust you when you say it. Or maybe she only trusts people from New Jersey, and you’re from Jersey but the guy is from New York. There are a thousand reasons why certain people will listen to you deliver your message and nobody else, even if 10,000 other people have already delivered it. On top of that, just because it’s been said doesn’t mean everyone in your audience has already heard it. You might be the first person they hear it from. There are many lies we tell ourselves to avoid responsibility and give in to our fears. Whatever the cause, when we keep our mouths shut the world misses out. Someone isn’t inspired the way they would have been. Somebody’s life isn’t changed. Your story matters. What you have to say is important. Whatever shortcomings you may have as a person of influence, you can overcome them and become influential. Got an excuse I didn’t address? Tell me about it in the comments below.